Jets wide receiver Brandon Marshall scores on a pass from quarterback Ryan Fitzpatrick during the second half. Ryan Fitzpatrick threw two touchdown passes and ran for another score, and the New York Jets overcame a sloppy first half to beat the banged-up Washington Redskins 34-20 on Sunday. Chris Ivory ran for 146 yards and a TD on 20 carries for the Jets, who improved to 4-1 for the first time since 2010. 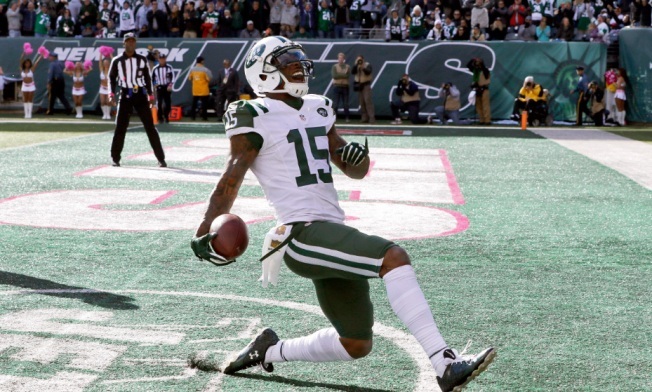 Brandon Marshall had seven catches for 111 yards, and Eric Decker also caught a TD. The Jets, coming off a bye-week break, trailed 13-10 at halftime, with the Redskins (2-4) scoring their points off three turnovers -- all by Bashaud Breeland. But New York opened the second half with 24 straight points to take control against a Washington team without several starters, including wide receiver DeSean Jackson and cornerbacks DeAngelo Hall and Chris Culliver. Kirk Cousins finished with a touchdown and two interceptions for the Redskins.